I do not consider the computer my friend. We have a very edgy relationship, my computer and I, maybe something akin to that between a lion tamer and a lion. You may think yourself in control but you never know when the beast will turn on you. I am not fond of people or objects that are so capricious. Last night, for instance, I was working innocently away when the screen suddenly turned shadowy and everything froze. No amount of clicking, cussing, or pleading could get it to react. Finally, I just gave up and shut off the power. Later in the evening when I went back to it, it booted up with it's cheery major six-chord as though nothing had happened. We've all had "friends" like this but we've never really trusted them, have we? Understand that I am to a savvy computer-user as "Chopsticks" is to Chopin's "Revolutionary Etude". I can do the simple things. Email has been a pleasure . Textediting has kept me in touch with old acquaintances who still use snail mail. (If I wrote in longhand, they would think a chicken had walked through an inkwell and across the page. I can't even read my own grocery lists.) I have become somewhat of a Facebook addict, checking a couple of times a day to see who is doing what. I can access a link and I have finally learned about Copy and Paste. But I have no idea how to change my profile picture on Facebook, or how to add clever photos to my blogs, like Erika, or to forward most stuff. How do you put those cute little hearts in your statuses? My hairdresser does all her bills, taxes, banking, and all other business on her computer and is always prattling away about storing and back-upping and other foreign terms. People earn their livings using the computer! My mind boggles. It is not as though I am dying to do any of these things. I would just like to be sure this computer knows who is boss. The idea that a machine is smarter than I am makes me mad. And uneasy. 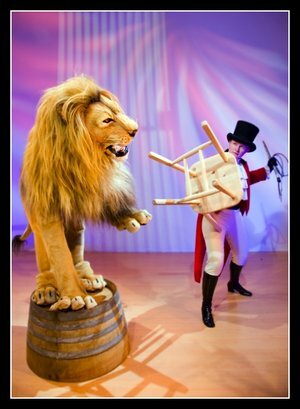 I can feel that lion watching me and although I ought to be the controlling factor, I am keeping that whip and chair handy, just in case.